The patronizing, ahistorical nonsense of Trump’s black outreach. The patronizing, ahistorical nonsense of his black “outreach” isn’t unique to Trump. The Rev. 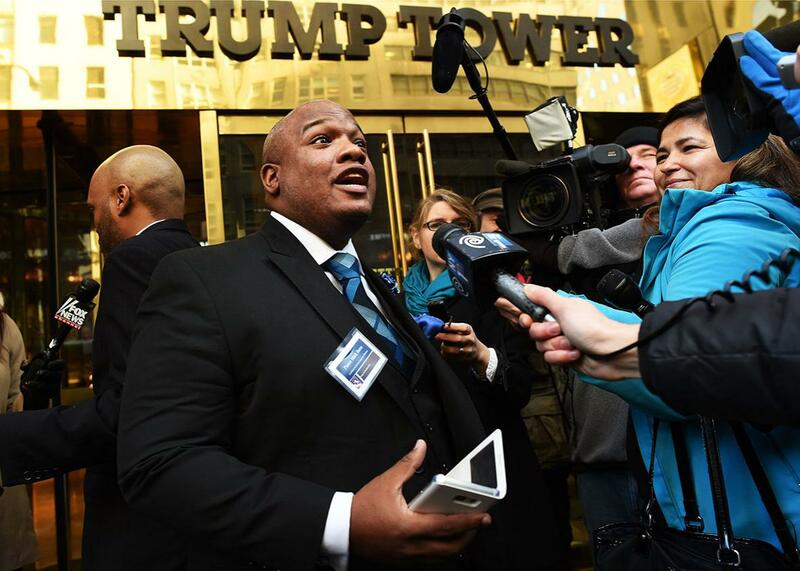 Mark Burns arrives at Trump Tower for a meeting with Donald Trump in New York City on Nov. 30, 2015. In a sign of confidence, however, Trump plans to take his message to Detroit, where he’ll hold his first event in a predominantly black community, speaking with Bishop Wayne T. Jackson of Great Faith Ministries. There’s a strong chance he’ll stick to his present pitch, even as it lands flat with the vast majority of black voters. That fact—black indifference or even antipathy to Trump and his rhetoric—deserves a little more attention. It’s not that black voters are hostile to Trump; it’s that they won’t even entertain his basic message. There’s nothing he could say or do in the realm of possibility that would budge his numbers away from historic lows, much less restore them to the double digits enjoyed by George W. Bush in the 2004 election. Given the real problems facing black voters—including higher rates of joblessness and criminal victimization—why aren’t they receptive to Trump’s message? The simple answer is that it’s patronizing, ahistorical nonsense that’s not at all unique to Trump. The problem goes beyond the mere optics of his “outreach”—producing dystopian portraits of black life for predominantly white audiences. And it’s not just the extent to which Trump is talking about black Americans rather than to them. The central issue is that Trump portrays black Americans not as able citizens who need to be convinced, but as mindless followers of a failed regime. In this narrative, black Americans are mere objects—means to a partisan end. They do not choose or act as political agents. There are no black politicians or activists or leaders of any stripe. Instead, they are acted upon, tools of Hillary Clinton and the Democratic Party. And worse, despite the horrors of Democratic governance, they don’t understand that they’ve been used and “betrayed.” They still vote for Democrats in overwhelming numbers. They are dupes. Key to the “plantation” theory is the idea that modern Democrats are direct heirs to the white supremacist Democratic Party of the 19th and early 20th centuries. For proponents, it is a straight line from John C. Calhoun to Jefferson Davis to Theodore Bilbo to Lyndon Johnson to Barack Obama and Hillary Clinton. You hear this in Trump’s rhetoric as well. “We reject the bigotry of Hillary Clinton,” he has said, “which panders to and talks down to communities of color and sees them only as votes, not as individual human beings worthy of a better future.” Whereas Bilbo relied on terrorism to suppress blacks, modern Democrats use the welfare state to achieve the same ends. And the apex of this arrangement is in the inner cities governed for generations by ruinous Democratic policies. These narratives and arguments are bizarre to the point of incoherence, a fourth-rate imitation of history, devoid of any actual meaning. Shaped, influenced, and even driven by black Americans in the middle of the 20th century, the modern Democratic Party is not the literal descendant of the white supremacist party that bore the name for a century; in much of the modern-day South, black Americans are the Democratic Party. Black Americans have had an active role in Democratic Party politics for two generations, culminating in the election of Barack Obama, a black American. More broadly, blacks have not been led astray—they are not victims of false consciousness or some “plantation mentality.” They are political actors making choices based on their interests as they see them. Likewise, the issues in urban America aren’t the product of the Democratic Party or the black mayors and city councilors who took the reins of the cities in the 1970s and 1980s. The decline of Detroit or Cleveland or Baltimore didn’t begin in 1967. Instead, they’re the cumulative result of a century of policies, from redlining and housing discrimination to white flight, federal neglect, and ongoing hostility from surrounding municipalities. There’s no question that these cities have been marred by bad governance, but to understand that in terms of party affiliation—neglecting the effects of deindustrialization, racism, and capital flight—is to show profound ignorance of urban politics and problems. What’s key is that black voters hear this sentiment in the rhetoric used by Trump and other conservatives. It’s one reason that, despite having been peddled in its current incarnation by black conservatives and their allies for the better part of a decade, the argument has never gotten any traction. The other reason is Barack Obama. Tens of millions of black Americans hold the president and his family in high esteem as exemplars of the black community. For them, he deserves respect regardless of your politics. And if there’s anything that defines the GOP in the present age for black voters, it’s the outsized disrespect for Obama, from South Carolina Rep. Joe Wilson’s “you lie” to the birther crusade pursued so vigorously by Trump and others. Black Americans see this, and they remember. Somewhere in the multiverse is a world where black voters have warmed to Donald Trump. It’s not this one. In this world, for blacks to reconsider Trump and the Republican Party, they would have to ignore his birtherism; they would have to ignore the push for voter ID and the attacks on civil rights legislation; they would have to downplay the patronizing “outreach” of conservative voices and Republican politicians. For blacks to reconsider Trump, they would have to act as if they were the dupes of his imagination.